The minimalist style is perfect for today’s contemporary mood, offering timeless spaces and evocations. Just a few simple elements, skilfully chosen colours, combinations that underline details without predominating or overdoing things. This is one of the most popular styles at the moment, cutting across the many design trends that have appeared at the international design shows and are still appearing in the trends for 2019. Contemporary surfaces, particularly those made of top-quality porcelain, play a key role in spaces in the minimalist style, both in creation of the overall atmosphere and aesthetic and thanks to their evocative and dramatic power. The possibilities available to designers and their clients have expanded since porcelain introduced the trend toward large sizes, with single maxi-slabs covering up to 4.5 sqm. Architectural design thus underlines the expressive power of porcelain maxi-slabs, exploiting all the aesthetic properties of the marble, wood and stone effects. Leading porcelain tile manufacturer Ariostea is one of the principal brands in the Iris Ceramica Group, an internationally prominent group of ceramics companies. With hundreds of collections on the market, the Iris Ceramica Group has been promoting the prestige and spirit of Italian ceramics since 1961, drawing on Italy’s ancient ceramics tradition and technological innovation and strictly selecting natural raw materials appreciated all over the world. All in compliance with the strictest sustainability standards for the production process and designer products. Ariostea is a pioneer of innovation in technical and aesthetic ceramics, for it was Ariostea that "launched “ceramic” wood on the market in 2007, imitating a natural raw material without cutting down any trees, just as it had done in the past with stone and marble, while guaranteeing technical performance for even the most extreme applications". Today, at Cersaie 2018, the Ariostea brand explores new top-quality solutions for today’s spaces using the cement/resin-effect ofand CON.CREA. slabs, a collection already available in the Ultra large sizes. So CON.CREA. now includes tiles in traditional sizes, such as 120x60 cm, 60x60 cm and 60x30 cm: "versatile new sizes combining the advanced technical performance of Ariostea porcelain tiles with a timeless look that can now dress up smaller architectural spaces too". The inspiration behind CON.CREA. comes from brushed cement and synthetic resins: a combination of materials giving surfaces an unmistakably contemporary mood. The five colours in the collection, Dove Grey, Earth, Ink, Talk and Cloud, are delicate neutral hues which make use of the soft, enveloping tactile effect for an advanced, versatile form of minimalism for indoor and outdoor use. At Cersaie 2018, the colour palette of Ultra CON.CREA. maxi-slabs is completed with Dove Grey: ordered by temperature grade, the collection explores the fascination of shades ranging from deep black to soft white and all the colours in between. The result is a surface "of great depth, characterised by material vibrations and gradations". The new materials Ariostea presented at Cersaie are completed by the tenth Ariostea ULTRA collection: Blend.HT stone-effect porcelain. 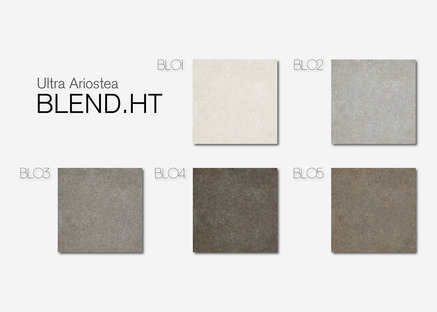 Designed for floor and wall coverings and for a vast range of applications of porcelain on objects and furnishings, Blend.HT guarantees the utmost flexibility and is available in the 100X100 cm size at only 6 mm thick. Inspired by a natural material, a symbol of solidity and resistance, Blend.HT is also available in five soft, neutral hues, ranging from beiges to browns and two shades of grey.